FIAP > Featured Content > Xavier Sala I Martin commented on the inefficiency of the PAYGO systems. The renowned Catalonian economist commented on the inefficiency of the PAYGO systems. He also pointed out that the returns of the PAYGO systems are very low because they depend solely on the growth of wages. Colombia has to sort out its corruption issues, improve its infrastructure and invest in education. Cartagena, April 13 2018. 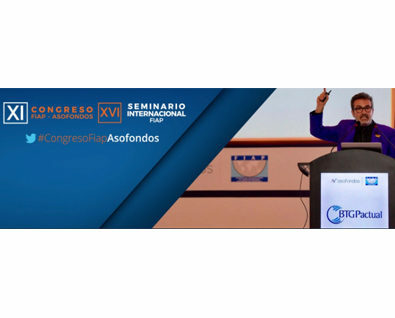 At closure of the 11th FIAP-Asofondos Congress, Professor Xavier Sala i Martin described the design and performance of the PAYGO systems, asserting that they work like a pyramid scheme in practice. According to the economist, the system operates that way because a broad base initially contributed for a few, but that base is disappearing, making the system unviable. “The time will come when all the money in the world will be used for paying the previous generation. Since this cannot be, there will always be a time when it is impossible to continue with the pyramid scheme,” he said. And what does he recommend for Colombia? 1) Institutions: the degree of corruption and the concentration of power are very alarming. This must be resolved. 3) Education is a failure; Colombian students are significantly lagging compared to students in the rest of the world, and will not be able to deal with the fourth industrial revolution. On this issue, he mentioned that the educational base is not prepared to incorporate new technologies, because there is no money. And there is no money because the social security deficit is very high.